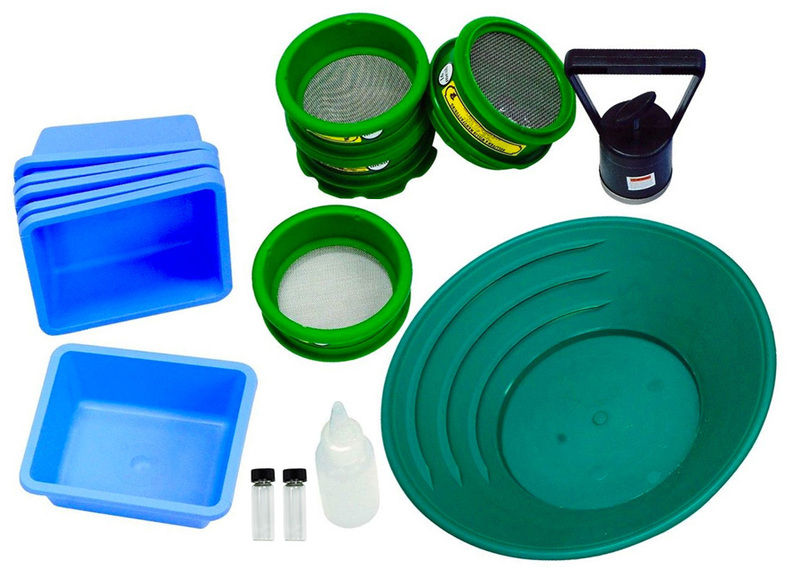 This very affordable Gold Cube Clean Up Kit contains all the gear you need to clean up you super concentrates— a 10 inch green pan, an 8-lb. magnetic separator pick-up tool with quick release, snuffer bottle, 6 plastic mini tubs (2" tall x 4-3/4 x 5-3/8 inches), and 4 classifers. The 4 inch stackable classifiers include 1 each of these 4 sizes: 16 mesh, 30 mesh, 50 mesh and 100 mesh screens. Kit weighs about 3 pounds. Shipping box is approx. 13 x 13 x 9 inches. Check out the video for final clean up tips from the manufacturer of the Gold Cube.